Elizabeth Spencer (1737 – 1831) was a handsome woman, much admired by the King. She became Lady of the Bedchamber to Queen Charlotte in the latter half of the eighteenth century. Suffering through the numerous infidelities of her husband, Henry Herbert, 10th earl of Pembroke, she finally separated from him in 1788, thanks to the King’s generosity in giving her a residence. She lived forever, it seems, even outlasting her son, the third Earl of Pembroke. 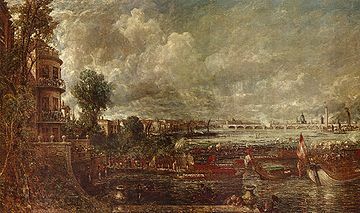 Her London residence was Pembroke House, immortalized in Constable’s The Opening of Waterloo Bridge (1832). It was built on the rubble of Whitehall Palace, where various persons swore they saw the ghost of Henry VIII on the night of his only son’s death. Now Pembroke House is rubble, the foundation for the Ministry of Defense. This entry was posted in Regency, Uncategorized and tagged Countess of Pembroke, Lady Elizabeth Spenser Herbert, Madness of King George III, Pembroke House, Queen Charlotte, Waterloo Bridge by Angelyn. Bookmark the permalink. She sounds like an interesting woman. Is more known about her? She was rather older than the movie depicts her. It is difficult to fathom how she could have persuaded those close to the king to change course using the method in the movie (at her age.) Frankly, I think Charlotte could hold her own against the Regent and probably didn’t need a Lady of the Bedchamber to assist her (mein Gott!) But her ladyship’s trials in putting up with her husband, her devotion to her son and her long life are testaments to her character.